The flow of lean to healthcare has increased rapidly in the last few years, and Andy Brophy is one of those folks who arrived there from manufacturing. Andy is based in County Offaly, Ireland, and shared some updates with me the other day. In healthcare organizations large and small, releasing employees, mainly through attrition, will save some money, but someone will have to do the work these people have been doing. Either the remaining staff will be overburdened or someone must eliminate the waste that keeps them from doing the work in the time available to do it. Removing waste from work doesn't always start with an efficiency study. Andy emphasizes that a focus on cost cutting doesn't usually create a lot of commitment, but that hospital workers want to improve care. And improving care reduces costs in many instances. Andy worked with one hospital to reduce injuries due to falls. Employees focused attention on the position of patients, making sure they were seated or in bed at a height they could stand up from, for example. Data showed that many falls occurred during shift changes, when patients tried to do on their own what they needed help with: going to the bathroom or getting water. Ensuring that shift change didn't cause gaps in patient assistance made a difference. Visual controls were used to flag patients who were fragile or otherwise had a greater risk of falls, so closer attention would be paid to their safety. Other initiatives focused on what nurses were spending their time doing. It's typical to find that they spend large chunks of time walking or searching for things. When 1,000 small improvements can be made in a week of effort, labeling and changing storage locations can begin to melt away the waste and put nurses at the bedside, where they really want to be. When nurses are with the patients, there are fewer falls, mistakes, and other adverse outcomes. The important thing is that the nurses themselves, along with other patient care and support staff, identify changes and implement them. Management supports and sustains the process, but it's owned by the people who do the work. Andy subscribes to the school of thought that people are full of creative and innovative ideas. 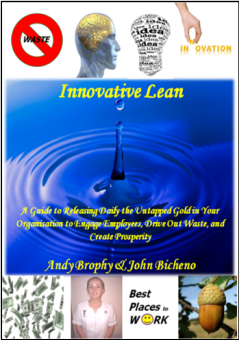 The title of his book, "Innovative Lean: A guide to releasing the untapped gold in your organisation, to engage employees, drive out waste and create prosperity," co-authored with John Bicheno of the Lean Enterprise Research Center at Cardiff University, tells it all. He says, "Ideas are not treated as ad hoc actions or suggestions. There is a system where ideas are visually displayed on boards, implemented fast, and recognised. People are coached to recognize 'hidden' waste and the idea system is integrated into daily problem solving. The employee’s manager mentors and supports him or her during implementation. Employees are coached as to what constitutes a good idea. A 'bad idea' is a training opportunity -- the intent behind it is teased out and put forward again. The key is to tap into people’s intrinsic motivation, the natural desire that they have to make a positive difference. The greatest reward for employees is to see their ideas used." 1. Employees write down ideas every time they see an opportunity for improvement and post them on the local idea board with a picture if possible. 2. The idea generator evaluates and filters their idea with their peers, and their supervisor responds within 24 hours. 4. The person who comes up with the original idea implements it themselves or with their work team. If additional help is needed from a support function like maintenance, it is provided and the idea originator oversees the completion of their task. 5. Record implemented ideas in an idea log electronically. 6. Monthly metrics include: number of ideas per employee/team, volume of implemented ideas, participation rate and implementation time. "If the cycle above flows smoothly the improvement activity will also flow slickly," Andy says, "One idea will lead to another and continuous improvement will translate into improved performance and higher employee engagement." My talk with Andy helped me see that lean is making the leap from manufacturing into healthcare because principles are becoming explicit and teachable. A critical mass of experience in healthcare improvement is being collected by groups like Andy's, at Lean Enterprise Institute's healthcare education efforts led by Mark Graban, at the Institute for Healthcare Improvement (IHI). Now lean and quality leaders in hospitals can draw on examples and benchmarks that make sense to people there. Using examples from automobile assembly is no longer necessary. What's next? Extracting principles from experience makes lean possible in a whole array of industries: Auto repair shops, trucking companies, government agencies, public utilities, and more. It's a trend to watch. ... In a typical automotive assembly plant, supporting every employee working on the line, there are at least 10 additional employees working somewhere within the supply chain. Suppliers … the hidden factory. So imagine if you struggle with communication internally how can you bridge the link to your external suppliers? We will outline some proven tools and tricks that may help you improve supplier communication and trust. The market will establish the price so when working with suppliers it should not become part of the discussions towards improvement … it will evolve naturally. Inventory is time … but it is also a reflection of the amount of trust that exists between you and your supplier. If you have been stocked out or shorted on occasion it is natural to bolster the inventory levels … primarily since no one ever wants to be scolded for shutting down a line due to lack of inventory. The most extreme engagement of a supplier with your organization. I learned of this concept many years ago when visiting BOSE speakers and then promptly followed suit. We provided our major suppliers with a desk, telephone and full system access. In essence they were responsible to conduct the planning requirements for their commodity and ultimately placing orders to themselves. Of course this created tons of alarms within accounting … but like most accounting systems we had the inherent controls in place. If the supplier wanted to change the price our standard cost system would immediately alert us to a purchase price variance. We loved this supply chain technique. It allowed us to manage our 600+ suppliers with just a few buyers. We watched our inventory begin to melt away because no computer system could match the speed of human communication. Also our computer systems never tracked promotional projects that were being or the anticipation of new significant contracts. A great by-product of commodity management was as our suppliers became more familiar with the use of their products and services within our operation they were able to make suggestions that enhanced quality while reducing costs … add this to the ability to reduce our procurement lead-time we quickly had a significant competitive advantage within our industry sector. You are busy within your organization investigating and researching new technologies that will continue to provide your product or service the leadership position it deserves. But are you alone in this endeavour? Of course not, with this in mind we decided to host a formal event annually where our R&D scientists and sales folks discussed emerging desires of the consumer and how we were going to address those needs. We then opened the venue to see what emerging technologies our suppliers were developing … by beginning early integration of the emerging technologies we were first to market with the new technology and a distinct advantage. You inspect and then count and double count items before shipping only to have your customer do the same thing upon receipt … What does this symbolize about trust? We know that inspection is a non-value added activity so it makes sense to find a way to reduce and eliminate this activity. With SSCP both sides (supplier and customer) begin/continue extensive inspection and collaboration related to inspection requirements. As the trust grows, inspection requirements begin to diminish to the point where the goods received are delivered directly to the Point of Use. Typically incoming inspection will only identify the most blatant deviations and the real problems are identified when the operator attempts to use the item and then you become victim of missing a delivery promise. Of course, if an incident occurs then the Certification process begins over. Typically a particular supplier will get tagged as being a horrible supplier to deal with, quality and delivery issues. Often the supplier is unfairly judged, typically as a result of the volume of product they supply. Here is where TCOP is a great tool. It contains both a subjective and quantitative evaluation of your supplier. The TCOP Report captures subjective results related to Quality, Delivery, Service and Cost and then quantifies them for every $1,000 of annual spend conducted with that supplier. The TCOP report also works as an excellent working agenda with your suppliers on the path of improvement. I recall using the report to eliminate the confusion of on-time delivery … supplier thought our request date meant their ship date when it was our required dock date … the result as an overall 3 day reduction of our on hand inventory. Doing the inverse of TCOP to measure your relationship with your customer works equally as well to reduce disturbances to flow and a cooperative attitude to reducing relationship overhead costs providing for a more competitive strategy. Of course nothing can replace the importance of relationships with your suppliers, so encourage your senior leaders to spend time with them … but make sure you have good relationship measurement tool in place. For a sample of a Supplier Performance Report you can contact Richard at rkunst@kunstartofsolutions.com.